Scanner Pro is a great tool if you ever find yourself needing a copy of a document, but don’t happen to have a scanner with you. You basically take a picture of a page with your iPhone, adjust the brightness and contrast, and voila! You have a copy of the document stored to your phone. Sounds a little like a regular photo app, right? Well, Readdle developed this app specifically to take good pictures and give you plenty of options. After you have taken a picture, set the corners or crop your photo, then adjust the brightness accordingly, after you are finished editing, pick your route of delivery. This is where I believe the app goes above and beyond a normal photo app that just takes good pictures. After editing the scanned copy of the document, you can email it as a PDF, upload it to Evernote, and my favorite, post it on Google Docs. I played around with Scanner Pro for a while and although it can’t replicate an actual scanner, it comes pretty close. Just make sure you’re in a well-lit area with no shadows, and your paper is flat. I “scanned” some notes from my class as well as a typed paper. The notes came out ok, and the typed paper came out even better. I was able to adjust the brightness and that helped make my documents more clear. I emailed my PDF to myself, however, for some reason, it took about 5 minutes for the document to actually send. The process to do all of this was easy; the iPhone app walks you through each stage. A map appears on the screen before you begin to scan your image, which gives you a clear idea of the steps you will take and your delivery options. I am using an iPhone 3G, this means I have a fixed focus lens; therefore my images came out clear. However, the iPhone 3GS doesn’t have a fixed focus lens and this may affect your pictures. Scanner Pro does have an image stabilizing setting you can turn on if you’ve got a shaky hand. Whew! This is a long review for a reason, this iPhone app is packed full of options, making the scanner-less dilemma non-existent. I’ve had this app for two days and I’ve already put it to frequent use. For $6.99 this app is well worth the money for the convenience it offers. 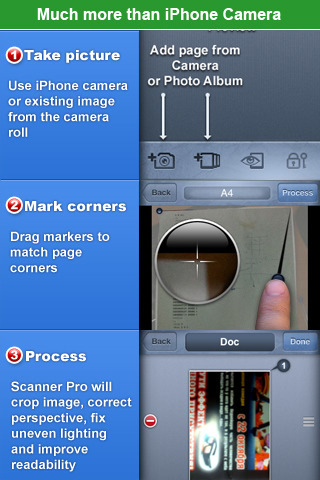 AppSafari review of Scanner Pro was written by Amanda McFarland on April 10th, 2010 and categorized under App Store, Featured, Files, Productivity, Utilities. Page viewed 4103 times, 1 so far today. Need help on using these apps? Please read the Help Page.